Hello, everybody! I hope you are having an excellent start of your week! I did not post Friday, like I normally do, since I had a special post on Wednesday (the video). However, do not fear, for a new riddle is here! I have heard this riddle from a few friends of mine (yes, I have been told this riddle multiple times), so I decided that this would be a great time to share it with the rest of you. Joey Smitha (the ‘a’ is silent) was just arrested for wearing a speedo in the small country of Houndation, where wearing a speedo is a high criminal offense. The judge let Joey decide his own fate, and gave him the option between 3 different chambers he could choose for his punishment. The first chamber is full of raging fire. The second chamber has 20 assassins who are ordered to kill Joey. The third chamber is full of lions who haven’t eaten for years. Which room is the safest room for Joey? What do you think? Put your answers in the comment section below! Now I am doing something new for the riddle series. 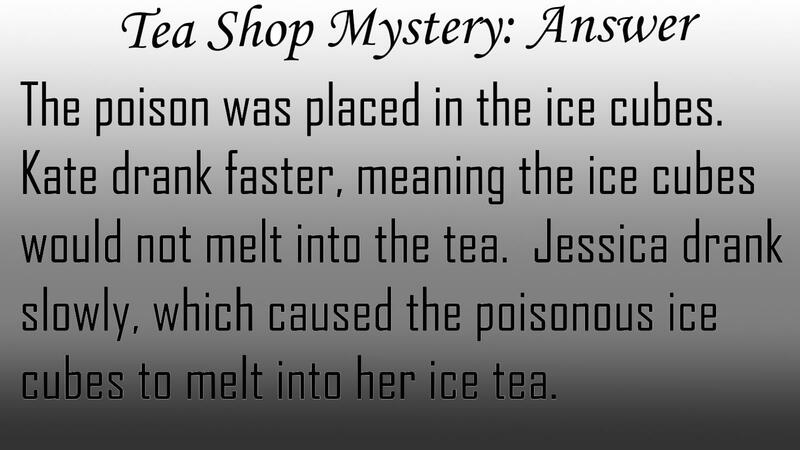 Normally, I do not post the answers of the riddles, because that makes it too easy! However, each new riddle will have the previous riddle’s answer. I think this is a good balance and is fair to everyone. That’s it for this post, and remember, do WLYF!